How would you like to go to a neighborhood shop and be able to borrow a power drill, a tent for camping, games, or even an ice cream maker, similar to how you can borrow a book from a public library? What started as a relatively small number of “tool libraries” a few years ago has blossomed into a movement with hundreds of specialty and general lending libraries where people can gain access to tools, camping gear, sporting goods, small kitchen appliances, musical instruments, and just about any other product. Items shared via these Libraries of Things are often being reused tens to hundreds of times more than they would be if they were owned by just one person. When I helped start the West Seattle Tool Library in 2010, we were primarily looking at the environmental impacts of consumption, including: resource extraction, worldwide supply chains, manufacturing, transportation, storage, usage, and disposal of products. With waste piling up, plastic filling our oceans, and greenhouse gases pouring into our atmosphere, society is in dire need of solutions. Reducing consumption by radically reusing products promises to be a big one. Still, saving planet Earth isn’t the only reason to start a Library of Things. Want to start a Library of Things? on Wednesday, August 22, 2018. The most successful Libraries of Things are the ones that do more than just lend items; they also create a strong sense of community. What I was not expecting in Seattle—and what hundreds of communities around the world are finding out—is that Libraries of Things also build connected, resilient communities. Libraries of Things achieve this by providing space for people to come together to help each other, learn new skills, access tools and equipment they might not be able to otherwise afford, and even start businesses. And to help ensure that everyone in the community can benefit, most Libraries of Things offer memberships based on a sliding scale to make sure that everyone has access to the library’s goods. 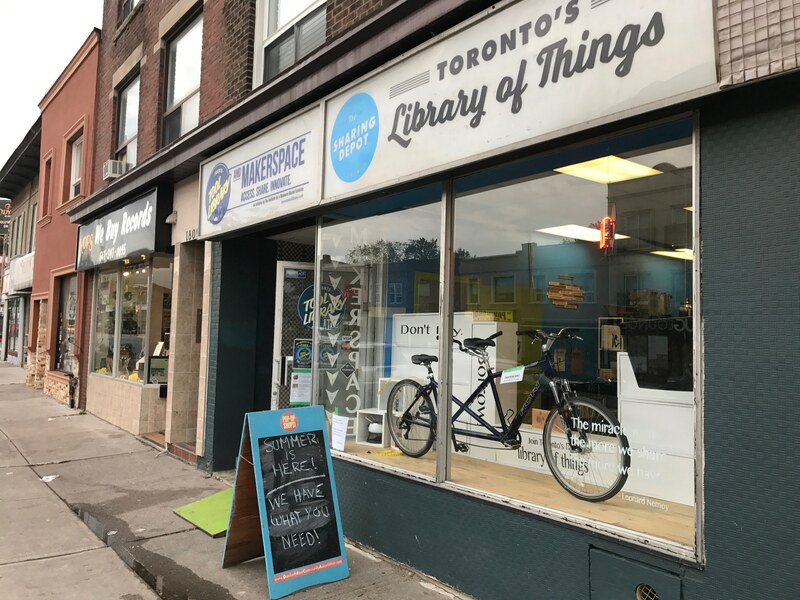 Started as as single tool library, the Toronto Tool Library and Sharing Depot now offers three (soon to be four) locations, including two general Libraries of Things around the city of Toronto. You can learn new skills and access a full makerspace with 3D printers, laser cutters, a wood shop and a community that knows how to have fun and get things done! 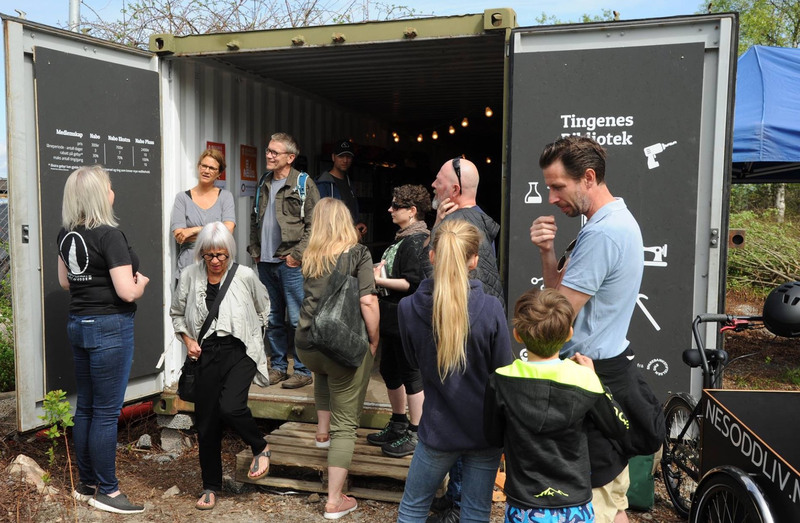 Norway's first Library of Things, Tingenes Bibliotek, recently opened in a shipping container—actually two, the second is a mini-makerspace—in a community outside of Oslo, and their first paid staff member is a recent immigrant. Mother Hubbard’s Cupboard aims to increase access to healthy food for all people with a food pantry, community garden, and youth gardening and cooking programs. They take sharing to the next level with a community garden and by lending gardening and cooking tools to help people with food insecurity grow and prepare their own food. Since its founding, Station North Tool Library has become an important community resource in Baltimore, offering people the the ability to borrow tools, use a full wood shop, or take any of dozens of classes to learn valuable skills. They even offered a workforce development program, the Surface Project, where youth and individuals with high barriers to employment were provided the business and technical skills needed to take locally sourced reclaimed materials and create value-added products like beautiful tabletops. One of the first such spaces to be called a Library of Things, SHARE is located in a small town in southwest England and was originally started in only eight weeks! Now, even businesses are starting to get into the act by offering Libraries of Things to their employees to spur innovation, as an employee perk, and to reduce their own environmental impacts. At work, at play, or in your community, more and more people around the world are realizing the joy of being able to access the things they need, without the burden of buying, storing, and eventually having to dispose of them. sign up for a webinar on August 22, 2018 on “How to Start a Library of Things” hosted by Shareable.net and NewDream.org. Can’t wait for the webinar? Learn more about some of the Libraries above and other inspiring projects from a number of articles from New Dream and Shareable. Gene Homicki, a serial technology entrepreneur with a passion for sustainability, loved the idea of Tool Libraries and Libraries of Things so much that he co-founded myTurn.com, pbc. myTurn offers a software platform and related services to help communities, universities, businesses, and governments start and manage Libraries of Things and build Circular Economy ecosytems.